"Looking at astro formations, we begin the week with Aquarius rising and Moon in Gemini, in the 5th. Jupiter retro is in the 6th, Venus and Sun are in the 12th.After a weak start markets may bounce back, especially till the Full Moon. Full Moon on 4th February, triggers the Uranus Mars midpoint and gives an effect which is as if Mars is in conjunction to Uranus. Already Uranus and Ketu are inflamed. Since they are in Mercury star, they have been giving sudden, surprising moves in all markets, especially in the currency market. With this translation, Mars also adds its aggression to the equation. Since Pisces represents religious beliefs through Jupiter, terrorism could also escalate, till Jupiter trines with these planets. 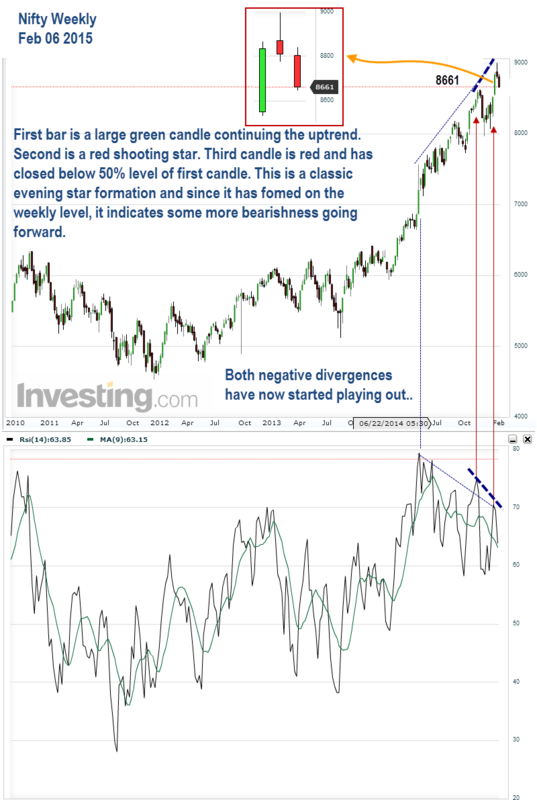 More volatility and divergences are expected in financial markets. So the Full Moon may provide fresh triggers to continue the downtrend. The uptrend which began on January 15th, did not change track on January 22, when Mercury became retrograde, but went on right upto January 30, 2015. We have often seen that if a market does not change direction when Mercury goes retrograde, often does so during the mid-period of Mercury retrograde. February 02, 2015 is the tradable Mercury retro mid period day. And February 11, happens to be the date when Mercury becomes direct. 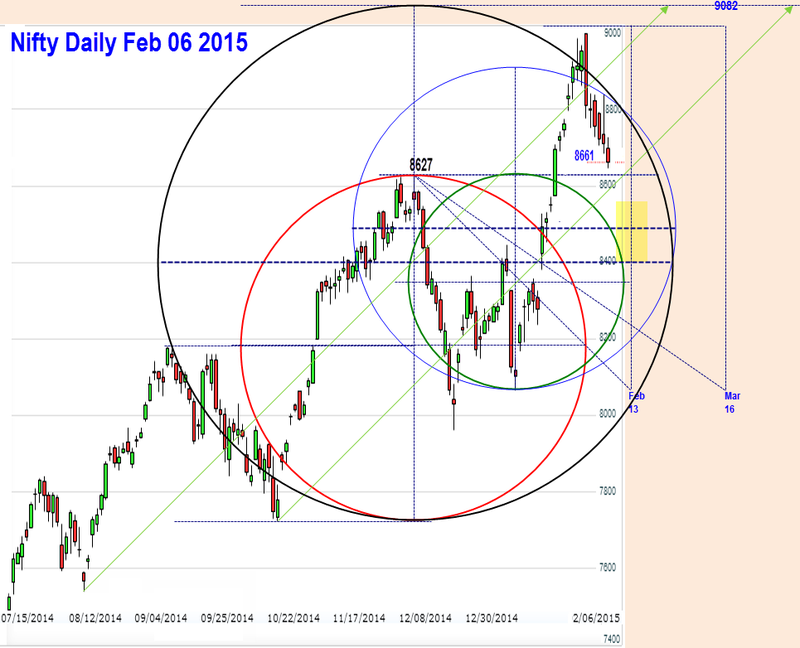 Nifty started a down move on January 30, one trading day before Mercury retro mid period day of February 02. So, will this down trend continue till Mercury becomes direct? That is, till February 11, 2015? By the weekend, another important aspect will come into play. Capricorn Sun will oppose Cancerian, retro Jupiter. Given its customary orb, we may see a reversal in the period February 11 to 16, 2015. So the question is, considering Mercury phenomenon and Jupiter Sun aspect together, will we see a bottom next week?" Mercury continues its retrograde motion and Nifty followed suit throughout the week. We expected a bounce by the Full Moon and that too happened. Full Moon triggered further down fall and Nifty came down upto 8646 before closing at 8661. Mercury becomes direct on February 12th.Transiting Lagna at 09 am starts transiting in the ninth house for Nifty Futures, from February 13 onwards. 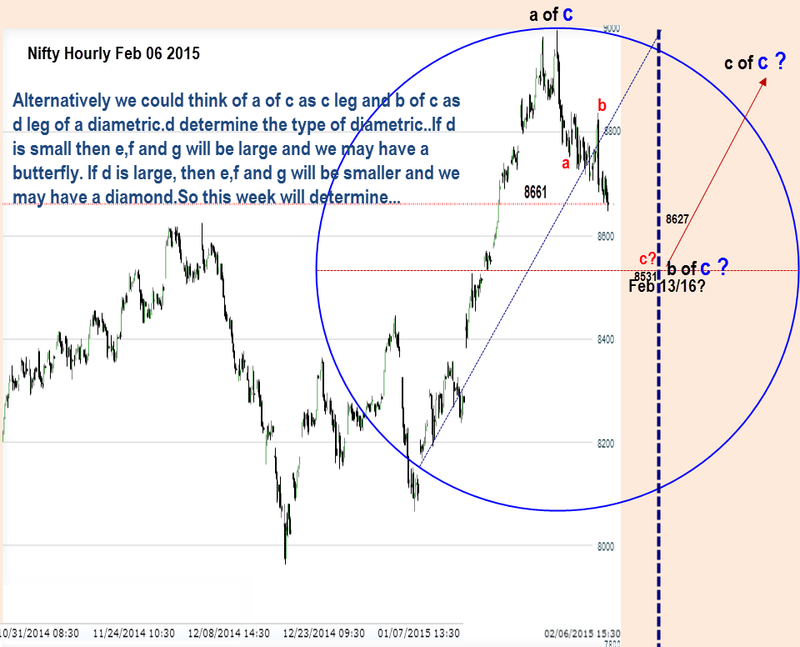 So most probably we may see a low formation this week and Nifty should get into pre budget rally from the weekend. Sun Jupiter opposition occurred on February 06, 2015.Nifty low formation could also be by February 12/13, based on this important aspect. Of course these are just our assumptions. Let us watch and ascertain what really happens. Starting from February 16th right upto March 15th, 2015, we are about to go through an intense astro time. There are several aspects which will culminate and bring in major effects in all walks of life, including financial markets. Entry of Mars into Pisces and Venus into Aquarius merely marks a beginning. On the longer term we find that we are entering a very important reversal period by March 16-20 2015, based on 56 /57 week trends. On a shorter time period. Nifty has formed an evening star on the weekly. 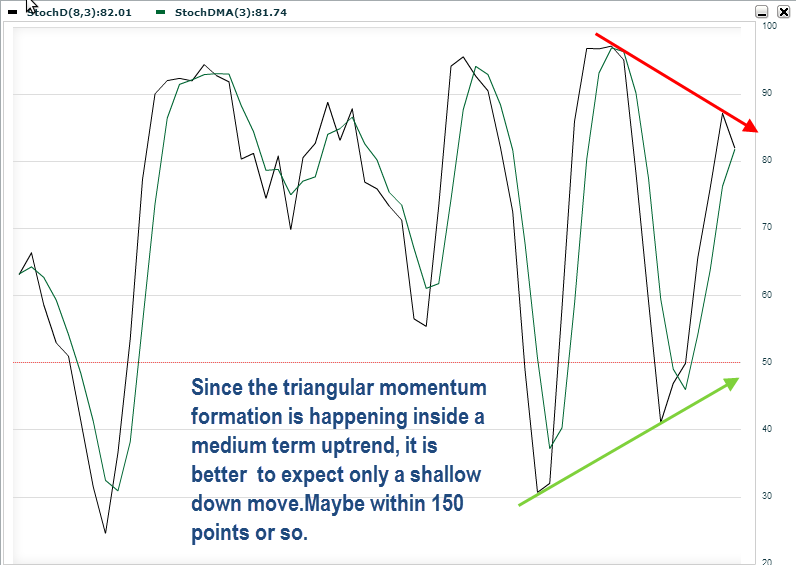 This means some more down move is to be expected this week, before a low is formed.Looking at triangular formation in stochastics, maybe not more than 150 points? It does not matter..if short, just ride the pony, till it bucks. Cycle updates continue on expected lines. Interaction between the 23 day and 108 day cycle should produce a shallow bottom. Interestingly 12/13 March is the classical cycle top. 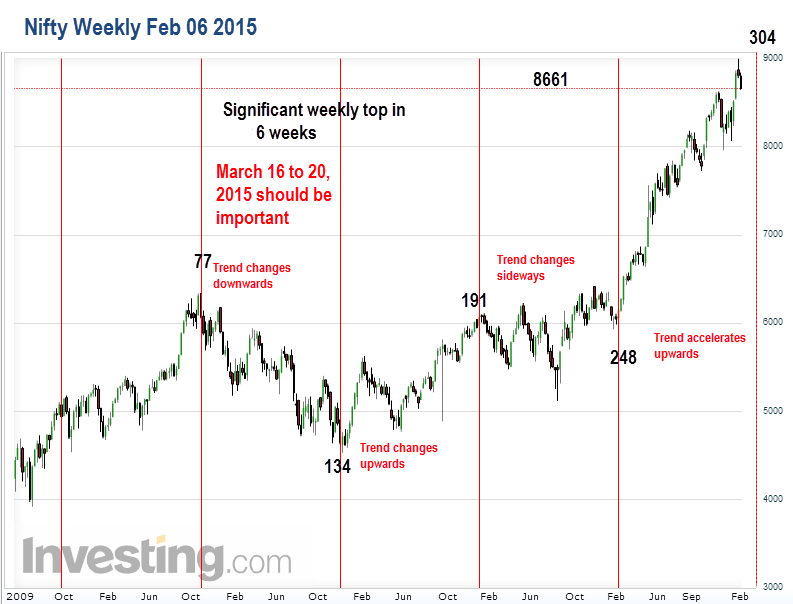 March 16 is the weekly cycle top. That is also the time zone for the last Uranus Pluto square.. 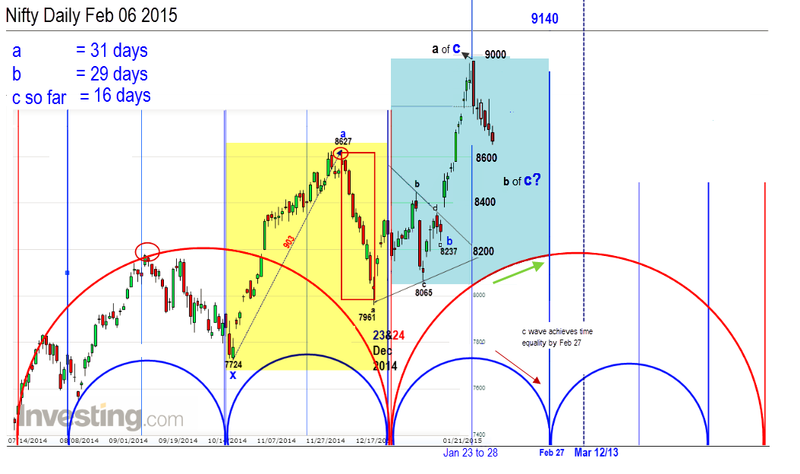 Cycles also point out the same..9082 is the level to watch out for. Black and red cycles form a pair. Blue and green cycles another pair.You can see that Nifty had exceeded the blue cycle target and has reversed. 8531 is an important level to watch out for. It is formed inside the yellow band. very interesting week ahead.... thanks for the analysis Sureshji. Yes. The week could be interesting. Sureshji, 150 points down today. Can we see a reversal from here or further down side is possible. Manoj, the smartest thing to do in trading is just following the trend.All I know is that as per past history Nifty has done up to 8 days in a trot in a down move.There always was a bounce.So that could give a bounce tomorrow. Will it be a dead cat bounce? That has to be seen.Personally I had covered all my shorts today. Even if the market goes down a bit more, I wouldn't bother.I will only wait for a low to be in.We need not catch the lowest low do we? would you please reply to my query posted through facebook...........I am eagerly waiting for it..